30 Teams. 30 Posts: The Dodgers | ninety feet of perfection. Jackie Robinson. When I was in 2nd grade at Holmes Elementary in San Diego, My teacher Miss Sakaguchi taught the class about the Civil Rights Movement and that lesson included Jackie Robinson. I instantly fell in love with the man, his legacy, how he played the game, etc. Although I was very young and didn’t understand everything about Civil Rights Movement or the Baseball Color Line, I knew that Martin Luther King Jr and Jackie Robinson were the first “heroes” that I ever had. This in turn made me like the Dodgers. 1988 World Series. My first memory of watching the World Series was in 1988 when the Dodgers played against the Athletics. At this time I lived in Medford, Oregon which is A’s land due to one of their Minor League affiliates (The Medford/Southern Oregon A’s) being from there. I love the A’s due to this reason and obviously rooted for them. However that 1988 Dodgers team with Tommy Lasorda as Manager and league MVP Kirk Gibson made fall in love with the game of Baseball on an whole another level as there was something special about that team. Needless to say, I wasn’t too upset with the A’s when they lost the series. I only remember being bummed when I realized that I had to wait 6 months to watch Major League Baseball again. So that’s it in a nutshell. As usual, here are 5 of my favorite Dodgers related photos. The 1955 Brooklyn Dodgers, potentially my favorite Major League Baseball team of all time. 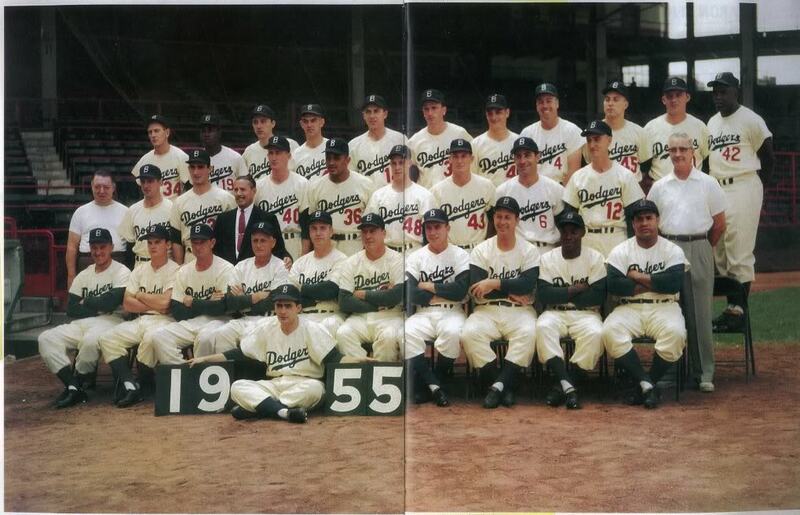 I am convinced that if you do not like or at least appreciate the ’55 Dodgers then you don’t love the game of Baseball. Such a great story, such great players. 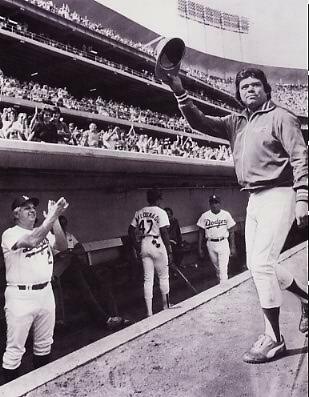 One of the first professional Baseball players I was nuts about was the one and only Fernando Valenzuela. Unfortunately, I was too young to fully experience the peak of “Fernando-Mania” which is kind of a bummer. At least I wasn’t too young that I missed all of his productive years. If you ever get a chance to watch the ESPN 30 for 30 for documentary “Fernando Nation,” do yourself a favor and check it out. You can watch a clip of it HERE. How great is this photo of young Fernando? Tommy Lasorda giving him a hand in the dugout is pure Baseball gold. Kirk Gibson, Game 1 of the 1988 World Series. Need I say anything else? To this day, still one of, if not the greatest World Series moment ever. To watch video of the bottom of 9th inning from that incredible game, click HERE. I have watched this countless times in my life and still do not get sick of it. Orel Hershiser. In 1988, the Bulldog literally destroyed the opposition that season. On September 28th of that year he broke Don Drysdale’s scoreless innings record of 59 innings which still stands to this day. In addition to the record, that season he won the Cy Young award, a Gold Glove, World Series MVP, Sporting News Pitcher of the Year and the Sports Illustrated Sportsman of the Year award. He was also an All-Star. Basically everything Orel did in 1988 was awesome. Sandy Koufax and Don Drysdale. Imagine if these two studs were the number 1 & 2 Pitchers in favorite team’s starting rotation. National League hitters must have been so bummed out when playing the Dodgers and had to face both Drysdale and Koufax in the same series. If National League hitters happened to miss facing both of them in a series against the Dodgers then they must have celebrated like it was a gift from the Baseball gods. ~ by duaneharris19 on August 18, 2011.